The Great Treasury Dumping Game Begins? So — as Japan enters its third lost decade — is the United States headed for a growth-free and deflation-heavy future? Well, Japan has been in a state of stasis supported by debt. While its government has massive debts — over 220% of GDP — these debts are predominantly owed to domestic creditors. Japan also has a very high personal and household savings rate. America, on the other hand, is in huge debt to hostile foreign creditors, but not only this, monetary easing is not so much a domestic policy as it is an international one, because of the dollar’s role as the global reserve currency. Essentially Japan’s slowdown and life-support was never quite as threatening to its ability to produce the necessary goods and services as America’s. Japan is less dependent on imports than America, which relies on its largest creditor to export vast quantities of consumer goods, basic materials and components. Japan does not have the same corrosive trade deficit with China. If — as mainstream economists hope — China can be patient enough to allow America to resolve its problems, and manufacture more at home then inflation is very unlikely. America may stumble through a lost decade, before new technologies, and new business models finally pull America out of the slump. American policy makers might even have the foresight to let failed business models fail and liquidate failed businesses, allowing for new growth to take root, and avoiding Japanese zombification. And now we get the news that creditors are currently engaged in a huge Treasury liquidation. Little did we know 5 short days ago just how violent the reaction by China would be (both post and pre-facto) to the Senate decision to propose a law for all out trade warfare with China. Now we know – in the week ended October 12, a further $17.7 billion was “removed” from the Fed’s custodial Treasury account, meaning that someone, somewhere is very displeased with US paper, and, far more importantly, what it represents, and wants to make their displeasure heard loud and clear. Whether it is China – we do not know: we may have a better view in two months when the September/October TIC data hits, but even then it will be full of errors, as Direct Bidder purchases by the UK usually end up being assigned to China at the yearly TIC audit. And the sellers know this all too well. What they also know is that over the next few days (or weeks – ZH tends to be a little “aggressive” in its estimates for popular uptake), as soon as the broader population understands what has transpired, concerns about the reserve status of the greenback will start to resurface, precisely as many have been warning. 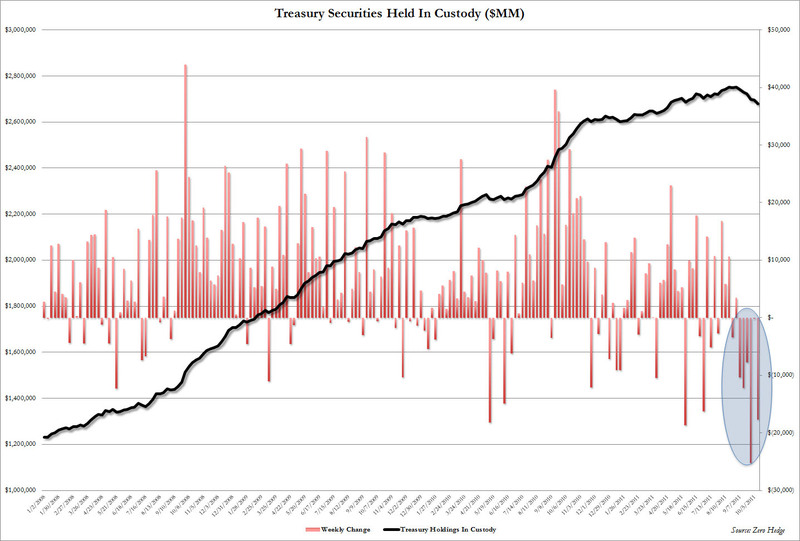 And what has happened is that in six consecutive weeks, foreigners have sold $74 billion, or more government bonds in a sequential period of time than ever before. So… perhaps it is time to reevaluate US intentions for a trade war with any of its “evil” mercantilist, UST-recycling partners. Unless, of course, they want $74 billion to become $740 billion, and to force the Fed to have no choice but to intervene, only this time not with a duration sterilized procedure, but one where the Fed has to buy everything that China et al are selling. Americans might not like the fact that they are doubly dependent on Chinese manufacturing and Chinese treasury-buying and that this has left them with a huge vulnerability, but shouldn’t this really be viewed as an opportunity for America (and the West) to reindustrialise and decrease dependency on foreign energy? After all, a free lunch isn’t a good lunch if it leaves you vulnerable. And what does this mean in the long run? Well, the mythology of Chinese currency manipulation looks set to soar, further antagonising the situation. The problem is that all of those dollars that have been liquidated out of Treasuries have to go somewhere, and a lot of them will go into buying up productive American assets. A flood of dollar repatriation is likely to have quite some inflationary impact. Maybe as Paul Krugman has said that could be a good thing, but maybe not. This entry was posted in International Relations and tagged black swans, hyperinflation. Bookmark the permalink. I never got what a “rigged” currency means. As long as the supply of the currency is controlled by the will of central banks (in the absence of a true gold standard) there’s simply (I may be mistaken) no such notion as a non-rigged currency. And yes, most central banks do this openly for the purpose of encouraging exports or encouraging internal consumption (whatever fits their bill). It seems to me that the idea of a manipulated currency only arises when there’s a big imbalance between some big players on the economic scene. Also, absent real-growth (which cannot be wished into existence and can only come from real advances in technology), globalization WILL make the (currently) rich countries poorer simply because others will be willing to work more for less. They can hide behind ideas like currency manipulation for the purpose of enacting trade barriers, but it’s as simple as that. Who is to say that China is a currency manipulator if they are simply willing to work more for less so that they can improve their life/future/infrastructure/etc.? The current ideas I believe, came about when the genius economists realized (not necessarily in a conscious way) that real-growth is not guaranteed to be continuous and only comes in punctuated-equilibrium jumps. Between these jumps, in the context of globalization, richer countries will get poorer. Probably they just thought that globalization can only be benign because unlimited growth is guaranteed forever. The basic fact against “currency manipulation” is that if the yuan is fixed and yuan-denominated produce is “mispriced” relative to dollars, prices would (through demand) adjust to negate the conversion difference. And that’s exactly what is happening. That’s why China currently has high inflation. OK, so I understand that there’s a limit where your (China’s) products become so competitive that the global demand will simply suffocate the supply (China’s). But, it seems that for the USA this mechanism (inflation) is not enough, and they want China to force their products to become less competitive (if a country thinks inflation is too high they can just adjust their internal policies at their own pace according to their own interests), just so they do not have to work too hard to become more competitive. Yes — America is demanding China forcibly make itself less competitive. I will label China as it is, a currency manipulator. And I will go after them for stealing our intellectual property. And they will recognize that if they cheat, there is a price to pay. I certainly don’t want a trade war … but we can’t have a trade surrender either. So instead of electing a humble and honest leader like Ron Paul who wants to restore America with hard work and diligence, it looks like America will elect a clown like Mitt Romney who wants to make America great again through threats and trade wars that will ultimately only drive America and the dollar further into the mud. The problem is, a nuclear-armed clown military superpower can cause a lot of problems for the world. But the truth is, if America can’t quell Iraq and Afghanistan, I doubt they can bend the Eurasian troika (Russia, China, Iran) to their will. America might try, but it’s a futile hope. In the end, America will have to regain her prowess the American way — through hard work, innovation, savings and diligence. At this point we could get real growth without much technology advancement but from from a reduction in government rent-seeking. China reduced its rent-seeking and it’s economy took off. Now, that’s not to say that China’s government(s) didn’t simply expand their leverage at the same time they reduced their rent-seeking, but much like Japan their leverage is almost completely internal. The US will have to deleverage its military. A US slowdown will mean a China slowdown. This deleveraging will benefit the Middle East, though not as greatly as they anticipate simply because their main asset will drop in value. The worldwide bills are coming due and when the tide goes out we’ll see who’s been swimming without a bathing suit. Growth comes the old fashioned way, sing labour (Get up early and go to work for 40 Hours), Precision Robotics and Improved Services (e.g. Banking at lower cost) through IT upgrades. We now produce so much so easily, there is no need for growth. With a high savings rate, we are now paying off the bill for all those Flat screen TVs and extra cars, boats and bloated houses. Nothing is well made any more, and God help us if the Chinese stop exporting their rubbish. I’ve heard this argument before about the Chinese exporting rubbish. And true, they do export a lot of rubbish (just like the Germans and most mercantilist countries – not everything comes out right). But this is in addition to 90% of what you use on a day to day basis (from iPads to car components). Seriously though, everyone else is a fascist, including Obama. A hard default on US treasuries would be better for the global economy than a hyperinflationary de-facto default. My analyst friends expect us to kick the can down the road like Japan did. Isn’t that a distinct possibility? I understand that Japan has mostly domestic debt, whereas the US owes hostile creditors like China. Any other reasons? Basically, kicking the can down the road in America (as you note) is a totally different proposition to Japan. America’s debt (discounting the Fed holdings which are just monetisation by stealth) is foreign-owned, and worse it is held by those upon whom America depends for goods, components and oil who can (I think) push America around as much as they like. America can’t sustain an occupation of iraq and Afghanistan — it just costs too much. The wars are projected to wind down in the next few years, and military spending at 50% of the total discretionary budget is inexcusable–especially with Occupy Wall Street gaining steam. That being said, I expect a revival of military Keynesianism by the likes of the Project for A New American Century, perhaps an invasion of Iran and/or Venezuela is in the cards. A second American revolution is utterly warranted, of course, but will authorities clamp down as they have done in China? As long as the US enjoys De Gaulle’s “exorbitant privilege” of printing the world reserve currency, we will continue to purchase Chinese goods at a discount and the sheep will remain tranquil. We’ve just seen China dump $32B in treasuries, and they will likely keep buying gold to diversify their $3T in reserves. The central issue that I still grapple with is deflation vs. hyperinflation. We’re undoubtedly in a period of stagflation/biflation. The rea economy could fall off a cliff, and/or the US could officially default on the debt, and send the world into deflation. This would be good, relative to hyperinflation as the currency would still be viable and the cash-holding middle class could still eat (albeit sparingly). Bernanke could also attempt to juice the equity markets and erode the national debt with slow inflation, but central bankers throughout history have a fatal tendency to overestimate their ability to tamp down hyperinflation. After hyperinflation, the hallmarks of deflation will set in, but will precious metals retain their value? It’s a huge risk to be in gold if the Fed FAILS at their mission and deflation sets in first. Where do you stand? I’m sure you have an opinion far more informed than mine on the deflation vs. hyperinflation debate… If you subscribe to the CFR/Trilaterial Commission/Bilderberger NWO hypothesis, which appears increasingly more credible, the destruction of the USD in favor of a new world reserve currency is the endgame. Keynes intended for it since Bretton Woods–“The Bancor.” We already have the aptly named “World Bank” and Bank for International Settlements. The IMF already has SDRs; it’s a slippery slope to a one-world currency.